Don't throw away those carrot tops! The leaves are filled with nutrients, and contain six times as much vitamin C as the carrots themselves. Their taste is slightly bitter, so here we've combined the leafy greens with the classic combination of crunchy sunflower and pumpkin seeds, basil, garlic, olive oil and grated Parmesan cheese. Toss the savory sauce with rotini pasta, which is perfect for coating with pesto thanks to its many grooves and ridges. With the help of your food processor or blender, you've got a delicious vegetarian, no-waste dinner on the table in 15 minutes. It's not only carrot tops that deserve the pesto treatment. Try other leafy greens such as arugula, kale, beet greens or even dandelion leaves. Experiment with different nuts in place of the pumpkin and sunflower seeds, like walnuts, almonds or cashews. Per Serving: 249 calories; 13g fat; 24.2g carbohydrates; 9g protein; 11mg cholesterol; 482mg sodium. I saved my carrot tops just so I could make this recipe. This made a delicious pesto, very flavorful. I tossed them in noodles with olive oil. So good! It's not often that I have carrot tops, but the few times I did, I saved them to make this recipe. It was really delicious! I tossed it in linguine noodles, so light and easy! Rarely do I buy carrots with the tops but I went to the farmers market this past weekend and picked up carrots with the leafy greens still attached. 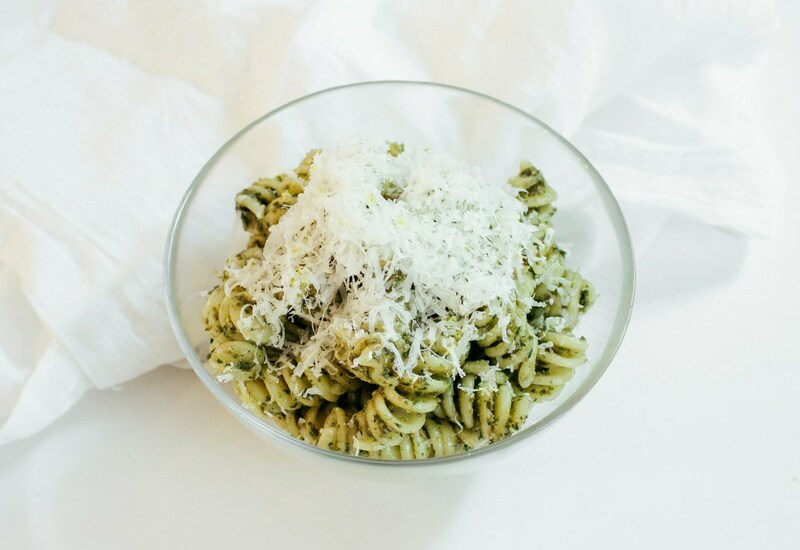 Perfect opportunity to make this delicious pesto! Ordinarily, I would have just tossed it in the trash. This was really tasty, it had a great flavor and went perfect with this ginger pasta I made. Made kale pesto instead of carrot top because I couldn't find any. Definitely a bummer, but the kale pesto turned out really delicious. In addition to the carrot top pesto, we topped the noodles with an Italian herb pan seared chicken and added roasted cherry tomatoes. It was really delicious, well-rounded weeknight meal.